Dentagen Toothpaste is a novel approach to dental plaque inhibition. It contains RF2, a natural anti-plaque compound that prevents oral bacteria from producing plaque. No other toothpaste has this inhibitory effect. 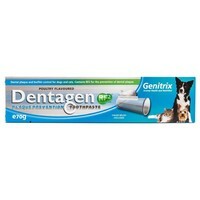 Dentagen Toothpaste 70g is packaged with a finger-brush and is poultry flavoured. Use the Dentagen chews so thought i would try toothpaste. The wider top gives a good amount for large dog although the enclosed finger brush is too long & thin. (I use one given by vet). Dog comes to have teeth done so must taste ok as he is fussy! STINKS.! This Cat/Dog toothpaste absolutely Stinks. The spell is very strong and horrible. The taste must be as well, as my Cat wouldn`t tolerate the taste in his mouth. Made teeth brushing impossible. Before I used LOGIC Hygiene Cat tooth gel. No smell and presume no taste. He doesn`t object to having his teeth brushed with that at all. So will be sticking to the Logic brand.